Newly built as well as already existing multi-purpose playgrounds and children's playgrounds equipped with the best designed play units don't guarantee safe play without quality fall zones. Rubber fall zones are designed to prevent injuries caused by falls or hard landing from a play unit. Using fall zones can ensure maximum safety during play. There is no need to construct an impact area for all the items we offer; if the critical fall height of a play item does not exceed 1 m, a well-maintained lawn will suffice. 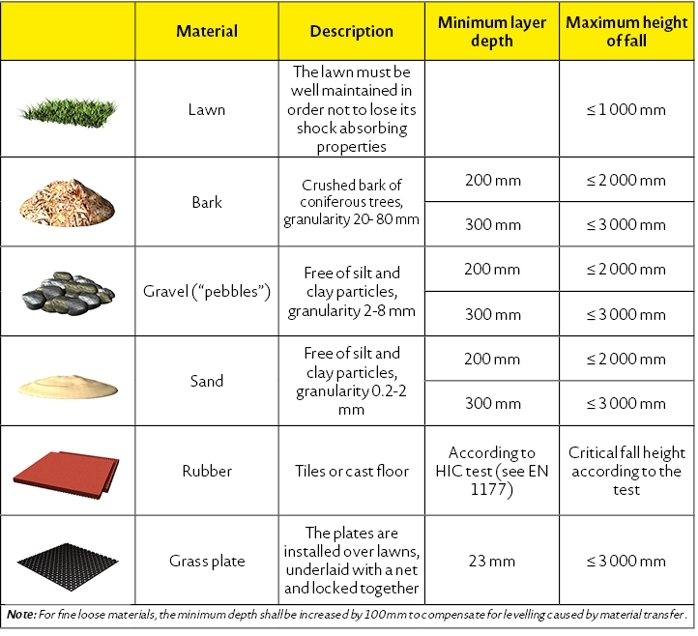 The table shows possible varieties of material to be used as impact absorbing surfaces. Impact areas are dealt with under the standards EN 1177 and EN 1176, which include a complete list of materials that can be used for this purpose. Fall zones can also be used for certain sports areas, e.g. long jump landing areas. Basic colour versions are black, red and green. The products are tested for the fall of a child from the heights of 1.1 m - 2.8 m depending on the thickness of the pad, and approved by the Chief Public Health Officer of the Czech Republic, decision ref. no. HEM - 3214 - 28. 5. – 7963/96. Certification of products for the safety during falls (by determining the critical fall height HIC according to the EN 1177 Czech Standard) was carried out at the ITC, a.s. test centre in Zlín. The pads can be placed on either a gravel or sand base. The warranty of 24 month is subject to the terms and conditions with regards to the laying of the pads. Our advice services are available throughout the year. Long-term retention of characteristics in temperatures between -40°C and 110°C. Grass pads meet the strict requirements of EN 1177 for a critical fall height up to 3 m; they are therefore suitable as impact areas for public playgrounds. The prices stated are for 1 m2. The prices and weights apply to 1 m2 of the pavement. The prices and weights apply to 1 bm.